• Marketplace support—Marketplace is a new online destination that lets users purchase presets and impulse responses created by select third-party content gurus. From the lower left-hand corner Helix Native, click "My Account" and then choose "Get More Presets..." or "Get More IRs..."
Helix Native delivers the same award-winning HX amp and effects modeling found in Line 6’s best-selling Helix hardware guitar and effects processors, bringing authentic tone to your favorite DAW. 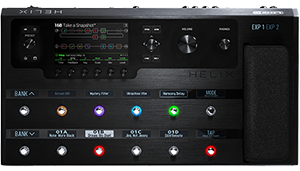 Helix Native is available as a fully functional 15-day free trial, which requires a Line 6 account. As the new HX Reverb models have been tweaked to sound notably “wetter”, any existing user presets that use these models will sound different. Although Helix and HX hardware has the ability to compensate for changes made to models when rebuilding presets (and one of our goals is to rarely if ever cause audible changes to existing user presets), the improvements made to the reverb blocks unfortunately cannot be compensated for. * In ProTools, the Compare function only loads the selected preset. In Logic 10.4.1, after moving an instance of Helix Native to another channel strip location, the Compare state can sometimes reverse. The DAW’s Compare function toggles between the two previously loaded presets, instead of toggling any edits made to the preset. A processing block cannot be moved between a Split or Mixer and another processing block. In Logic, switches 13-16, Master Input/Output, and Snapshot Index parameters are missing from the Automation lane list. HAVE A GREAT IDEA FOR HELIX NATIVE? If you have a great idea for Helix Native, we want to hear about it! Please visit *http://line6.ideascale.com* to post your requests and suggestions, or vote for features. This is the most direct way for you to influence our updates, and we look forward to hearing from you! - Cali Texas Ch2, based on* the drive channel of the MESA/Boogie® Lonestar (Ch1 coming later this spring). - Placater Dirty, based on* the BE/HBE channel of the Friedman® BE-100 (Clean channel coming later this spring). Helix Native now includes a library of effects from M13, M9, M5, DL4, DM4, FM4, and MM4. These appear in a new "Legacy" subcategory in the model list. - Distortion > Tube Drive, based on* the Chandler Tube Driver. - Distortion > Screamer, based on* the Ibanez® Tube Screamer®. - Distortion > Overdrive, based on* the DOD® Overdrive/Preamp 250. - Distortion > Classic Dist, based on* the ProCo Rat. - Distortion > Heavy Dist, based on* the BOSS® Metal Zone. - Distortion > Colordrive, based on* the Colorsound® Overdriver. - Distortion > Buzz Saw, based on* the Maestro® Fuzz Tone. - Distortion > Facial Fuzz, based on* the Arbiter® Fuzz Face®. - Distortion > Jumbo Fuzz, based on* the Vox® Tone Bender. - Distortion > Fuzz Pi, based on* the Electro-Harmonix® Big Muff Pi®. - Distortion > Jet Fuzz, based on* the Roland® Jet Phaser. - Distortion > Line 6 Drive, based on* the Colorsound® Overdriver (modded). - Distortion > Line 6 Distortion, Line 6 Original. - Distortion > Sub Oct Fuzz, based on* the PAiA Rocktave Divider. - Distortion > Octave Fuzz, based on* the Tycobrahe® Octavia. - Dynamics > Tube Comp, based on* the Teletronix® LA-2A®. - Dynamics > Red Comp, based on* the MXR® Dyna Comp. - Dynamics > Blue Comp, based on* the BOSS® CS-1. - Dynamics > Blue Comp Treb, based on* the BOSS® CS-1 (Treble switch on). - Dynamics > Vetta Comp, Line 6 Original. - Dynamics > Vetta Juice, Line 6 Original. - Dynamics > Boost Comp, based on* the MXR® Micro Amp. - Modulation > Pattern Tremolo, Line 6 Original. - Modulation > Panner, Line 6 Original. - Modulation > Bias Tremolo, based on* the 1960 Vox® AC-15 Tremolo. - Modulation > Opto Tremolo, based on* the 1964 Fender® Deluxe Reverb®. - Modulation > Script Phase, based on* the MXR® Phase 90 (script logo version). - Modulation > Panned Phaser, based on* the Ibanez® Flying Pan. - Modulation > Barberpole, Line 6 Original. - Modulation > Dual Phaser, based on* the Mu-Tron® Bi-Phase. - Modulation > U-Vibe, based on* the Shin-ei Uni-Vibe®. - Modulation > Phaser, based on* the MXR® Phase 90. - Modulation > Pitch Vibrato, based on* the BOSS® VB-2. - Modulation > Dimension, based on* the Roland® Dimension D.
- Modulation > Analog Chorus, based on* the BOSS® CE-1. - Modulation > Tri Chorus, based on* the Dytronics® Tri-Stereo Chorus. - Modulation > Analog Flanger, based on* the MXR® Flanger. - Modulation > Jet Flanger, based on* the A/DA Flanger. - Modulation > AC Flanger, based on* the MXR® Flanger. - Modulation > 80A Flanger, based on* the A/DA Flanger. - Modulation > Frequency Shift, Line 6 Original. - Modulation > Ring Modulator, Line 6 Original. - Modulation > Rotary Drum, based on* the Fender® Vibratone. - Modulation > Rotary Drm/Horn, based on* the Leslie® 145. - Delay > Ping Pong, Line 6 Original. - Delay > Dynamic, based on* the TC Electronic® 2290. - Delay > Stereo, Line 6 Original. - Delay > Digital, Line 6 Original. - Delay > Dig w/ Mod, Line 6 Original. - Delay > Reverse, Line 6 Original. - Delay > Lo Res, Line 6 Original. - Delay > Tube Echo, based on* the Maestro® Echoplex EP-1. - Delay > Tape Echo, based on* the Maestro® Echoplex EP-3. - Delay > Sweep Echo, Line 6 Original. - Delay > Echo Platter, based on* the Binson® EchoRec®. - Delay > Analog Echo, based on* the BOSS® DM-2. - Delay > Analog w/ Mod, based on* the Electro-Harmonix® Deluxe Memory Man. - Delay > Auto-Volume Echo, Line 6 Original. - Delay > Multi-Head, based on* the Roland® RE-101 Space Echo. - Pitch/Synth > Bass Octaver, based on* the EBS® OctaBass. - Pitch/Synth > Smart Harmony, based on* the Eventide® H3000. - Pitch/Synth > Octi Synth, Line 6 Original. - Pitch/Synth > Synth O Matic, Line 6 Original. - Pitch/Synth > Attack Synth, based on* the Korg® X911 Guitar Synth. - Pitch/Synth > Synth String, based on* the Roland® GR700 Guitar Synth. - Pitch/Synth > Growler, Line 6 Original. - Filter > Voice Box, Line 6 Original. 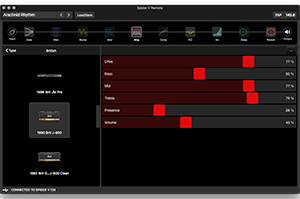 - Filter > V Tron, based on* the Musitronics® Mu-Tron® III. - Filter > Q Filter, Line 6 Original. - Filter > Seeker, based on* the Z Vex Seek Wah. - Filter > Obi Wah, based on* the Oberheim® voltage-controlled S&H filter. - Filter > Tron Up, based on* the Musitronics® Mu-Tron® III (up position). - Filter > Tron Down, based on* the Musitronics® Mu-Tron® III (down position). - Filter > Throbber, based on* the Electrix® Filter Factory. - Filter > Slow Filter, Line 6 Original. - Filter > Spin Cycle, based on* the Craig Anderton's Wah/Anti-Wah. - Filter > Comet Trails, Line 6 Original. Snapshots - Helix Native now supports up to eight Snapshots per preset. Drag block to clear - Click and drag a block out out of the signal flow view to clear it. Dragging a split/join block reveals insertion points between amp/effect positions (basically the same as previous behavior). Split/join positions can be nudged from any direction at any point along path A. 12 of Helix’s 17 reverbs originally appeared in M-Class processors and Verbzilla. As such, they’ve been moved into the new “Legacy” subcategory within the Reverb category. Helix's tempo no longer responds to pressing TAP at tempo lower than 40.0 BPM (Beats Per Minute). This is to ensure that multiple fast tap entries are recognized properly, as previously, they could be seen as one really slow tap entry. You may still manually select a tempo all the way down to 20.0 BPM and your presets can still be saved with tempi down to 20.0 BPM. If its Mid and Bass parameters are set to 0.0, the Cali IV Lead Amp/Amp+Cab model could sometimes exhibit a decrease in gain. The Tempo Host Sync would be lost when reloading a session. Pro Tools: Latency Compensation broken when Helix Native plugin is bypassed. Recalling an effect or instrument rack in Ableton Live with Helix Native instantiated can mute the track. Workaround: Uninstantiate and re-instantiate the plug-in. When using two 1024 IR's in a preset, moving the upper IR block before or after a pre/post split block can change the sonic character of the IR block. The copy/paste clipboard may be cleared after closing and reopening Helix Native. 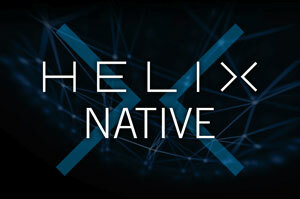 If you have a great idea for Helix Native, we want to hear about it! Please visit http://line6.ideascale.com to post your requests and suggestions, or vote for features. This is the most direct way for you to influence our updates, and we look forward to hearing from you! The new Helix® Native plug-in delivers the same award-winning HX amp and effects modeling found in the best-selling Line 6 Helix hardware guitar and effects processors, bringing authentic tone to your favorite DAW. Supports VST3, AAX, and AU, 64-bit only. Presets Compatible with Helix 2.21 firmware. Make sure your Helix hardware and editor software are up-to-date before transferring presets, setlists, etc. We're dedicated to being as transparent as possible, and here are the current known issues. Cali IV Lead Amp model will decrease in gain when Mid and Bass are set to 0. This is already known to occur on Helix hardware. Moving blocks while Automation is running may cause some errors during playback/record on Pro Tools. We've already received a ton of feature requests from beta users, but if you have a great idea for Helix Native, we want to hear about it! Please visit http://line6.ideascale.com to post your requests and suggestions, or vote for features. This is the most direct way for you to influence our updates, and we look forward to hearing from you! The new Helix® Native plug-in delivers the same award-winning HX amp and effects modeling found in Line 6’s best-selling Helix hardware guitar and effects processors, bringing authentic tone to your favorite DAW. At long last... We are very proud to announce that this is the first version of the Helix Native plug-in for VST3, AAX, and AU made available to the public! Try it for FREE for 15 days by clicking "start my 15-day free trial" on first launch. Check your Authorized Devices if you can't authorize Helix Native, you might have too many authorized devices on your account. We're dedicated to being as transparent as possible, and here's some not-so-great stuff that you may encounter. Editing min/max for automation of a parameter slider can temporarily stop reading the automation lane. Editing parameters assigned to automation can can temporarily stop reading the automation lane during playback/record. Unfreezing Tracks in Logic Pro X will darken the plug-in UI, just close and reopen it in the meantime. Where's VST2? If your DAW does not yet support the VST3 standard, like Ableton Live or Reason, be sure to check the "install VST2" checkbox during installation. Please temporarily disable your antivirus during the installation as some users have had trouble downloading or authorizing and we don't want that to happen to you too.